Ask fellow campers about "Smith Mountain Lake State Park" and nearby attractions. We drove from the Outer Banks here for a weekend getaway, and it was great. The staff were wonderful, and helped us with local information. The campground hosts were friendly and helpful. 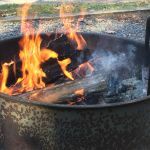 We were able to buy firewood and build a fire at our site. If you're going to go this route, make sure to bring something to split the wood with (lesson learned.) One important note - we drive a 40-foot motorhome, and our GPS originally routed us down some winding and steep mountain roads from Highway 460. If I were ever to make the trip again, I'd take Highway 122 South from 460 to State Road 608, then turn right onto State Road 626 to get to the park entrance. We took this route on our way out, and it was much more big-rig friendly. Great park and great people! We camped at Smith Mountain Lake State Park in a Motorhome. Big-rig drivers should follow my directions provided above to avoid steep and winding roads provided by most GPS units as good routes. Very pretty campground with lots of trees but no easy access to the lake. We were in a pull though sire which was very large and had an adequate size level spot in the center. Park is not easy to access as roads to and from the park are narrow, hilly , and have a great many curves and sharp turns. We camped at Smith Mountain Lake State Park in a Motorhome. Affordable campsites! Bathrooms and showers were clean. It is not lakefront. There is a trail down to the water but you cannot swim, launch kayaks, etc from it. Sites are gravel and fairly level. Campsites include 30 amp electric, water, fire ring and picnic table. There is a sewer dump, recycling, and dumpster on your way out. Firewood and vending machine for sodas at the bath house. Large sink to wash dishes at the bath house also. Great trails throughout the park, beach you can drive to, boat launch available. Cabins down the road which could be considered lake front with their own docks (from a trail). Beautiful scenery and hiking trails! There is not space for additional cars at the majority of the sites. Additional parking is close and easily within walking distance. Definitely check this place out and support our national parks! Be careful leaving out of the pull thrus, there is a concrete drop that you could scrape. We camped at Smith Mountain Lake State Park in a Fifth Wheel. Check out a marina and rent a boat, jet ski, kayak or stand up paddle board! Pack ALL of your necessities! Grocery stores are not located nearby, gas station is about 5-10 minutes away. Drove in in the dark from the BLUE Ridge Parkway. Not real close but campgrounds on Parkway closed this time of year. Immediately found a pull through with electric and water. Good Verizon service and satellite worked well. Bathrooms and showers some of best on road in two years. Daylight came and we saw just how beautiful this campground is. Highly recommend. We camped at Smith Mountain Lake State Park in a Travel Trailer. This is an excellent campground, and there were quite a few sites that will accommodate big rigs. We had no problem finding a spot for out 40-foot motor home. One can not reserve specific sites, so if you make reservations, tell them you have a big rig, so they will assign the appropriate site for you. The campsites are heavily wooded, so in most cases satellite TV is not an option. All sites have water and 30 amp electric, with no sewer hookup. This is probably one of the most pleasant campgrounds I have been in. We camped at Smith Mountain Lake State Park in a Motorhome. We stay here regularly because we like the access to the boat ramp they have. It is heavily covered with tree's so there is no satellite access. The work campers keep the restrooms pretty clean and the campground is clean. We usually come here on the weekends. We camped at Smith Mountain Lake State Park in a Motorhome. Rangers at check-in were very nice helpful. Campground sites were very clean and roomy. Had back-in and drive-through sites. Bathrooms and showers were very clean. Hiking trails very nice. Can cut fallen wood locally, or can buy. Beach area very nice. Going to the beach requires going in your vehicle. Can ride a bike to the beach but there are a couple of steep hills. Look forward to going again in 2014. We camped at Smith Mountain Lake State Park in a Motorhome. Nice campground with lots of trees and shade (but no view of the lake). If you have a larger rig, watch the turns; and the entry to some sites due to the tree branches. 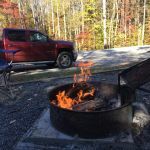 Roads and campsites are gravel; have tables, light post and fire-rings. Campsites are average-size, a few are pull-through. I did not find any 50-amp service, only 30-amp. No sewer hookups; has a typical campground dump station. Decent TV reception with the antenna. Bath and shower facilities are relatively new and were clean. We had good O/A internet service and Verizon cellphones had great reception. Campground hosts were extremely nice and helpful! NOTE: If traveling from the southeast and you use GPS, DO NOT let it bring you in at Gretna via Climax Road/Toler Ferry Road – this is a long, narrow, rough path. We would stay again. 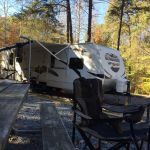 We camped at Smith Mountain Lake State Park in a Fifth Wheel. Very nice state park, beautiful white sand swimming beach, nice looking rental cabins. Good place to come with a boat (launch ramp in the park). You'll see LOTS of deer and wildlife here. Huge RV campsites, some are long pull-thrus, our 36' fit into a back-in just fine. Very steady power supply with great voltage and good clean water. There are no sewer hookups but there is a decent dump station with water for hose rinse. Our Verizon equipment (cell and personal wifi/mifi) worked great, but AT&T was spotty at best. TV brought in about 20 digital channels over-the-air antenna, good reception. Sat. TV dish will not work in most sites - lots of trees. Cons for this state park: fees, fees, fees. Campsite fees are average (approx $30 for W/E hookup), but separate fees for the swimming area, the boat launch, and a 'parking fee' for visitors (really an entrance fee, paid per car). If you don't mind the fees, it's a great place to visit. We camped at Smith Mountain Lake State Park in a Motorhome. Great park! Our stay was just not long enough. Beach area at lake area was very nice. Bathroom facilities clean. Staff friendly and very helpful. We will be back but for a longer stay. We camped at Smith Mountain Lake State Park in a Fifth Wheel. Beautiful park and campground. No internet available at site. Huge sites, clean restrooms. Did have decent TV reception. We camped at Smith Mountain Lake State Park in a Motorhome. Great park. The restrooms are cleaned all day long and into the night. The Discovery Center has so much for the kids to do. Staff keeps them busy learning and having fun. The lake beach is clean and modern with full snack bar, restrooms and lifeguards. Boat ramp and fishing pier. Saw many deer. Boat rentals available (reserve in advance). Wi-Fi at the Discovery center. Sites large, gravel, fairly level, fire ring, tent pads and picnic table. Easy back-ins and pull thru sites. We camped at Smith Mountain Lake State Park in a Tent Trailer. While this State Park does not have all the bells and whistles the other VA parks have, it is still a nice park in a primo location. Boat rentals are a short drive (Parrot Cove Marina) and there's great dining within a short distance (Bridgewater Plaza). Hiking is good but not challenging, great beach area, and fun canoeing/paddle boats. A day trip to Roanoke is fun to enjoy the historic Farmer's Market, Mill Mountain Star/Zoo, lunch at the historic Hotel Roanoke or shopping at Valley View Mall. We will return. We camped at Smith Mountain Lake State Park in a Travel Trailer. My wife and I have stayed at SML state park several times and love it. We have stayed here in a tent and a 21 ft travel trailer. The only bad thing I can say about the campground is that there is no sewage hook up, but that is the case with the VA state parks. The clean bathrooms and shower make up for the lack of sewage hookup. At the campground you are surrounded by woods. The camp hosts that we have, had have all been friendly and helpful. If you pay for one night, you get two days of swimming at the beach, which I do recommend. It’s only a short drive within the state park. The trails around the campground seem endless and can be hilly at times; very good for exercise. We camped at Smith Mountain Lake State Park in a Travel Trailer. Rates were high for a state park without sewer. A very personable check-in lady told us to select one of 5-6 pull-throughs. We drove past a few very unlevel sites, then tried out a site. Could not level our 38’ motorhome. Eventually found a long pull-through where we could level. Excellent showers and rest rooms. Water was 200 yards away. We camped at Smith Mountain Lake State Park in a Motorhome. Are you affiliated with Smith Mountain Lake State Park ?